The county council has responded to the ‘disastrous’ traffic situation at Polegate crossroads. A set of temporary lights have been put in place after a collision on the A2270 Eastbourne Road at its junction with Wannock Road broke the lights’ control box last Wednesday (January 16). Highways is working on repairs, but in the meantime the current system is causing major disruption as the lights get stuck on red or leave a tiny amount of time for drivers to get through. 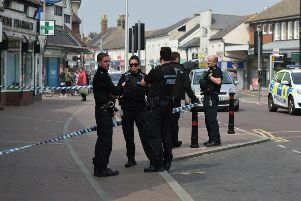 Frustrated motorists took to the Eastbourne Herald Facebook page to vent their anger. Penny Powell said, “We’d be better off with no lights than the current disastrous set up. Jake Wilson described it as a ‘car park’ while Clinton Sturn said the situation was causing ‘misery’ for thousands of drivers. And Paul Barden called it an ‘absolute traffic nightmare’. Responding to the situation, an East Sussex County Council spokesperson said, “This is a major road junction which carries a lot of traffic so unfortunately we are seeing disruption in this area and on surrounding roads. “The temporary lights are not as sophisticated as permanent ones and don’t link with the nearby signals at the junction of the A27 and A22, so traffic is flowing less smoothly than normal. “We are carrying out daily checks of the lights to make sure the phasing of the temporary lights are causing the least amount of disruption while we work on getting a permanent replacement. Highways previously said the controller that was damaged was ‘obsolete technology’ no longer available, and its contractor will need to build a new one using modern technology that will also require replacing the traffic light heads themselves and some of the sensors to integrate with the new controller. It is not expected to be fixed until later this month.